IVR solutions and the ecosystem that supports them aren't standing still. IVR has been around for quite some time, but advances have made this technology more valuable than ever before in the enterprise and contact center. As a bit of background, interactive voice response (IVR) is an automated telephony system that allows a pre-recorded voice to interact with humans through the use of voice and DTMF tones. It uses a telephony menu that enables identification, segmentation, and routing of callers to the most appropriate customer service or contact center agent. The system accepts a combination of voice input and touch-tone keypad selection and provides appropriate responses in the form of voice, fax, callback, e-mail, and perhaps other media. An IVR system consists of telephony equipment, software applications, a database, and supporting infrastructure. IVR systems deployed in the network are sized to handle large call volumes and are used for outbound calling, as IVR systems are more intelligent than many predictive dialer systems. While an IVR system is usually used as an entry point to route calls, you can also use IVR to automate tasks. That means a customer can get the job done and inquiries answered without ever having to speak to an actual agent. IVR reduces cost per call by letting customers choose the type of help they want, including self-service. Not only does the system free up agents to handle more complex cases that may require a special touch, but customers can quickly self-solve basic issues like bill payments, account inquiries, and more. But IVR solutions and the ecosystem that supports them are not standing still. Comprehensive hosted services, advances in speech technology, and omnichannel integration are examples of what's available today to application development and delivery (AD&D) professionals to provide improved voice self-service experiences for customers. increasing scalability and efficiency of organizations, the increasing integration of advanced technologies, and rise in cloud-based services that meet the industry standards for the IVR systems. 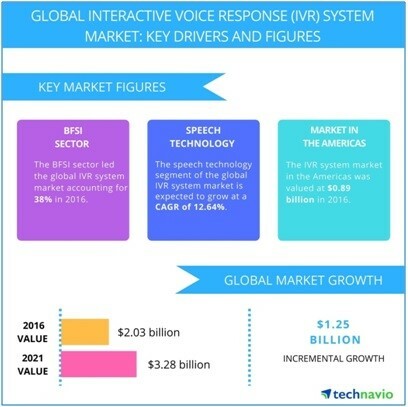 The overall IVR market in the North American region is highly fragmented with the presence of some large and several medium-sized companies that offer solutions for various verticals such as banking, financial services, and insurance; pharmaceutical and healthcare; government and public sector; and education. 8X8, Nuance Communications, Convergys, Avaya, Cisco, AT&T, West, Genesys,Verizon, 24/7, and Five9 are some of the major communications companies that offer IVR solutions. The adoption of cloud infrastructure boosts the demand for IVR systems. There is a growing adoption of cloud infrastructure within the enterprise, largely because of its ability to provide self-service applications at a minimal cost. IVR helps to simplify the interaction process. Companies of all sizes can take advantage of all the benefits without having to worry about the technical aspect, hardware costs, and computing budgets. Answering phone calls takes a lot of time, and not every phone call deserves the attention of a trained employee. IVR systems can take care of most frequently asked questions, such as office hours, directions, phone directory, common tech support questions, etc., and allow customer service agents to concentrate on the harder stuff. IVR systems are always available to customers regardless of time or day, while office hours, holidays, and breaks dictate and limit employee availability. With IVR, customers have unlimited access to your company as they can receive service whenever they need it. customers feel that they are being better attended to. If customers are calling with specific questions, automation can generate quick responses that are informative, as well as time efficient. Additionally, calls can now be answered on the first ring, which in turn reduces customer wait time and cuts call volume, saving time for both the customer and company agents. IVR systems also allow tremendous timesaving benefits for customers. In addition to being matched to the most qualified agent, customers do not have to listen to full menus and may click or touch their way quickly to the option they need. Automated speech recognition and text-to-speech in multiple languages makes the experience faster, and dropped calls are far less likely, when IVR systems are used. Great IVR experiences are definitely possible, and can be quicker and easier than other channels for certain tasks. But in order to get the most from your IVR, it's essential that the experience is usable, personalized, and integrated with other channels. Self-service is becoming channel-agnostic, as seen in how organizations structure internal functions. Creating a seamless customer experience with personalized IVR helps optimize your digital transformation and reduce the total cost of ownership. It can return major advantages compared to custom or silo-built solutions.